ITWeb’s “Meeting of the Minds” Artificial Intelligence conference took place in Johannesburg recently. Keynote speaker and professor of ethics Dr Aimee van Wynsberghe called for future-proofing AI with responsible design. Named one of Netherland’s top 400 influential women she is driving ethical-robotics thinking through her research and foundation work. She cited examples of human fatalities such as when a self driving Tesla killed a cyclist crossing the road. Even though in such cases the machine responds as programmed, the balance of ethical trade-offs often still results in the loss of life; if the Tesla braked too suddenly it may also have caused a collision. She was asked from the audience why we focus on a handful of machine-related fatalities every year but humans kill thousands of humans every year. She acknowledged that autonomous machine safety records are very good but countered that we have human laws to extract justice and repay the “debt” between humans. AI-related deaths are controversial because there is no recourse or justice system to punish robots; these and other dilemmas inform the growing and challenging field of robots and ethics. The main attraction of the event was a demo of Nedbank’s fully programmable humanoid robot Pepper. Built in Japan and set up locally, she can provide clients with basic information about products and services, as well as limited money management advice. However, “Pepper can easily be distracted when communicating with clients … resulting in her stopping the conversation halfway to focus on another client.” This according to Fabio Mione, head of strategic execution who presented a range of lessons learnt which included an unexpected negative perception in the media about the robot’s impact on human staff numbers. Another financial services player TransUnion is using AI to improve financial inclusion and reduce poverty. Head of analytics Tim Collins explained how the credit bureau is using alternative data to better understand people’s credit risk. This means that up to 3 million previously excluded consumers could start to get access to formal credit. He explained that “endless data points … social activities, friends, spending habits, social grants” offer new insights to profiling however there are security risks and regulation of customer data that must be considered. Head of Data Science at Standard Bank, Michelle Gervais spoke about their journey to improved decisioning through enhanced team cultures and optimised throughput of model production. Of the total time allocated for achieving business value, only 10% actually goes into building the model, while 40% is up front “data ingestion” and 50% is required for getting it into operation and proving business value. There is also a lack of business understanding about the power of intelligent decisioning. But according to Gervais at least executives no longer ask when AI robots will start running their businesses for them. Instead its about understanding how these new tools and insights give them new ways of driving business value. 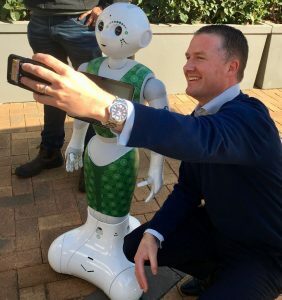 I certainly wasn’t passing up the opportunity for a selfie with Pepper and some insights about this banking innovation. Even though she was on a sensory tea-break she lifted her head when I spoke to her and looked at the camera when I said “selfie”. Pity she couldn’t open an account for me at the same time but I’m sure there is another bank that can do that?